The next game on my list to review is Tsuro: Game of the Path . 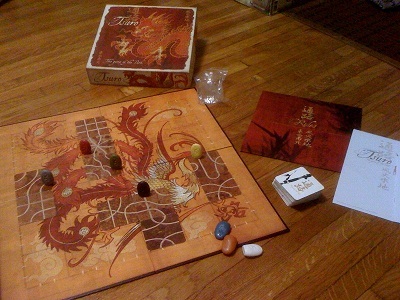 Tsuro is a very simple game and is easy to learn and fast to play. The time from opening the box until you have successfully completed your first game will probably be around 20 minutes (or less). Here is what happens: each player has 3 tiles. Each of these tiles has 8 points of entry drawn on them that are connected with 4 lines. On a given player's turn, he will place a tile, move all of the markers that are affected by that tile, and then draw a new tile. The object of the game is to be the last person to have their pawn remaining on the game board. How this works is that after you play a tile, if there is a pawn that was next to one of the entry points for the new tile that was placed, that pawn follows the route to wherever it dead-ends. If that dead-end is the edge of the game board, they are eliminated. There are several great aspects about Tsuro. First, it is a great filler game. I do not envision people getting together just to play it, but when they can't decide what to play next, or just have about 15 minutes to play, it is perfect. Also, Tsuro is very flexibile. It can be played with 2-8 players, and it plays equally well with any of those numbers. Next, it is incredibly easy to teach and is a game that draws people to it. If you play Tsuro in a public place, people will see it, be drawn to it, and then be easily included in the next game - thus attracting both gamers and non-gamers alike. The only real drawback to Tsuro is the opposite side of the coin of its greatest strength - simplicity. The game is so simple that it is not really a game that people will get together to play. It is a game that people, who are already together for another reason, will choose to play. More than a get together game, it is a front porch or coffee shop style of game. Overall, I give Tsuro an 8.0/10. What it does, it does extremely well! I would definitely recommend it to all ages that they try the game, and if you are looking for a good front-porch style game that can be played with non-gamers, it is one of the best options I have encountered. The game play is completely different, but I put this game in the same vein as Fluxx when it comes to fast, easy to learn but fun to play games.